Have you been interested in hunting for a while? Yes? Keep reading! Do you have no interest in hunting but love adorable, itty bitty dogs? Yes? Keep reading! Take a look at the jagdterrier, a hunting dog from Germany that is athletic, fearless, loving, and tons of fun! The jagdterrier (pronounced: YAHK-terrier) is small but fierce. The strong bodies of these hunting and sporting dogs are on average only 13-16 inches! Males fall between 20-22 pounds and females are on average 17-19 pounds. Jagdterriers have a lifespan of 12-15 years with a litter size of 3-8 puppies. A fairly new breed of dog, jagdterriers trace their lineage back to 1920s Germany. After the First World War, a group of hunters and game managers set out to create an impressive dog breed that exhibited excellent hunting performance. Modern-day jagdterriers all originate from four hunting dogs that were descendants of purebred fox terriers. The resulting jagdterriers are supreme hunting dogs that are hard working and highly trainable with natural hunting instincts. As sporting dogs, jagdterriers are highly active, athletic, and alert. They are quite the clever hunters and are known for their relentless bravery. While hunting, Jagdterriers never back down to even the most dangerous of wild game. These fiery dogs are extremely hard working, determined, and eager to please their masters. Jagdterriers do require a good deal of exercising whether it be out on the hunt or going for a long daily walk. This breed is compatible with highly active owners. Jagdterriers need a job to do and should not be kept only as a pet. Because of their small size, they are suited for apartment living and do not require a large yard. They will, however, be quite energetic in that apartment. Due to their naturally fearless and active state, Jagdterriers require supervision around very small children. These scrappy dogs are, however, good around bigger children. They are known to be affectionate and playful with them. This breed can get aggressive with other dogs and is not intimidated by larger breeds. They are not afraid to rumble. Jagdterriers are very trainable, requiring firm and consistent methods. They should be socialized from puppyhood. This small-bodied breed has a traditionally smooth, short, and hard coat. The coats are traditionally black, black and tan, or yellow. 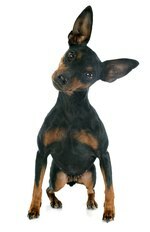 Jagdterriers have distinct physical characteristics shared with most working dogs: elongated heads, muscular and pronounced jaw muscles, well-sprung ribs and V-shaped ears. Jagdterriers should be groomed weekly with the occasional bath. Their nails are strong and grow quickly, and they should be cut regularly. Teeth should be brushed and ears should be checked regularly. Like all dogs, Jagdterriers require and deserve proper and regular grooming. Are you ready to meet more dog breeds? Scroll through this article about the Nova Scotia duck tolling retriever and the "driver dog" of Hungary, the mudi!